Hey everyone, we here at Yahoo Sports are doing real power rankings for teams Nos. 1-31. Here they are, based on only how I am feeling about these teams and their chances to win the Cup, meaning you can’t tell me I’m wrong because these are my feelings and feelings can’t be wrong. Please enjoy the Power Feelings. Worst record of the worst teams in the league this week, absolutely, but then to compound it with the owner once again saying people who criticize him aren’t “real fans,” calling out a well-respected local reporter, and then having even more fake Twitters come to light, this was another brutal week in Sensland. Of course, by Sensland standards, this was like a 3.5 out of 10. Which is actually worse, now that I think about it. Hey look, they beat Vegas. 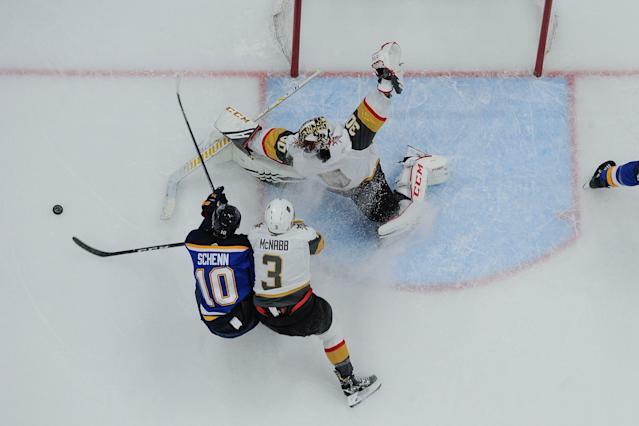 And sure it was in overtime, but no one’s beating Vegas much these days and when you had one win in 13 games before you started this little 3-1-0 run, I guess you gotta take what you can get. They signed Joel Farabee out of BU and one expects he’ll get some ice time down the stretch here. Good player, had a really nice rookie season. But could he have used another season of college? I’d say yeah. He led the team in scoring and had the most shots of anyone on the roster, but he’s not NHL-ready and he’s gotta get bigger. Not sure he can do that as easily in the A as he would at BU. But then again he wouldn’t be making six figures at BU next year, either, so you can’t blame him. With all the wins since firing Randy Carlyle (10 in 21 games) they’ve basically played themselves out of the bottom five. Maybe we shouldn’t have all been so hasty with the “fire Carlyle” stuff because this team needs talent ASAP and now they’re less likely to get it. I don’t know what’s prompted a lot of garment-rending among Canucks fans the last few days but I’ve seen a lot of it and haven’t cared to dig deeper. The idea that they haven’t learned anything about the need for some higher-end talent this year is, of course, an ever-present danger for them. You’d like to see them roll the dice next year with the kids, give Quinn Hughes the full run-out and all that, but you can’t discount the idea that they think their rebuild is done with wherever they pick in June. They’re officially out now and something’s gotta change. I can’t imagine why you keep the coach. The problem for these guys is that they’re the worst team in their division but they keep winning enough games to keep themselves out of the high picks barring some very lucky ping-pong bounces in a couple weeks. Which, jeez, this is the NHL and we live in an unending hell, so they’ll probably get the No. 1 pick. Very interesting that the team’s goaltending has totally held up in its recent run of failure but the mediocre-at-best group of forwards stopped shooting 10-plus percent. Very interesting indeed. So good that Jarmo Kekalainen is giving interviews about the team not wanting it enough and all that sort of thing. He said he wouldn’t make a coaching change this late in the season. That makes sense. But he also said that if anyone could figure out what’s wrong with the group, it’s John Tortorella. That does not make sense. Four wins in a row broken up by an OT loss in the second night of a home-and-home back-to-back with Chicago. It happens. Their next game is against Vegas, though, so I wouldn’t be too excited for them to pick it up again. But the game after that? It’s against Arizona. They might be able to put this race away by the end of the week, because Minnesota’s remaining schedule is brutal. They have points in seven of the last eight, and four straight, but two of the last four were OT losses to division rivals. The good news is they might end up with home ice in the first round, because four of their six remaining games are against either the Red Wings or Rangers. These guys haven’t lost two in a row in regulation since Jan. 15 and 18, when they dropped games to …. the Rangers and Senators? By a combined score of….. 10-3? Maybe that was the wakeup call these guys needed, though because they’re 20-6-2 in the last 28, scoring two-thirds of the goals in all situations (99-66). You love to see it. When one of your best players flat-out says the team in front of them in the division is just plain ol’ better than they are, that seems like a problem. Doesn’t mean he’s lying, but it also doesn’t portend good things for the second round, if they make it that far. The Caps are settling into a nice little groove at the top of the Metro but I get the last day of the season, when they host the Islanders, decides who wins it. On the other hand, Washington’s next three games are against Carolina in a home-and-home and at Tampa. Could be tough! They’re still missing Johansson, Krug, Grzelcyk, Miller, Kuraly, and Wagner. They’re on another four-game winning streak. I keep saying it, but if these guys are remotely healthy in the playoffs I think they give Tampa a better series than you would have expected. In three games this week, the Sharks went 0-2-1 and got .847 goaltending. They’ve now lost five in a row. Yes, they only have 12 goals in the last five games, and that’s bad. Yes, they only have 144 shots in those games, and that’s not good either. But when your goalies give up 23 goals on 155 shots, you’re not gonna have a chance most nights anyway, so what’s the bigger issue? Nothing against these guys to drop them a spot, but have you seen Vegas lately? Good lord. Yeah, they ended the week 10-1-1 since the deadline. Outscoring opponents 49-25. Outshooting them 456-363. Drawing penalties at a 32-28 clip. If they can tighten up the special teams (under 19 percent PP, 75 percent PK since the deadline), you might be able to book a clash of the titans with Tampa right now. Here’s your crazy Tampa stat for the week: They’ve only lost to (current) non-playoff teams seven times this season. One of those was in OT (to Minnesota). That means they’re 33-6-1 against non-playoff teams. A pace for 137-plus points. That’s how you take care of business and get yourself into the “Greatest Team Ever” conversation. Ryan Lambert is a Yahoo! Sports columnist. His email is here and his Twitter is here.